1. How can you organise many middle school students doing many different projects at the same time? 2. How can you help students while giving them the freedom of choice and independence of thought that come with genuine inquiry? Answer the questions-and face science fairs without fear-with the help of this book from the Science Fair Warm-Up series. This book, for grades 5-8, is particularly suited for those students who have not participated in a science fair before, as it lays a foundation for the ideas developed in the later books about the practices of scientists. Even students who have experienced science fairs will find many ideas about scientific practices that are new to them. In addition to offering original investigations, the book provides problem-solving exercises to help students develop the inquiry skills to carry the projects through. To save you time, the materials are organised to grow more challenging and encourage independent study as students progress through the grade levels. To help you meet your teaching goals, the series is based on the constructivist view that makes students responsible for their own learning and aligns with national standards and the new Framework for K-12 Science Education. 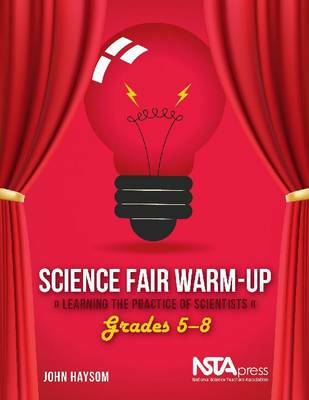 Science Fair Warm-Up will prepare both you and your students for science fair success. But even if you don't have a science fair in your future, the material can help make your students more proficient with scientific research.